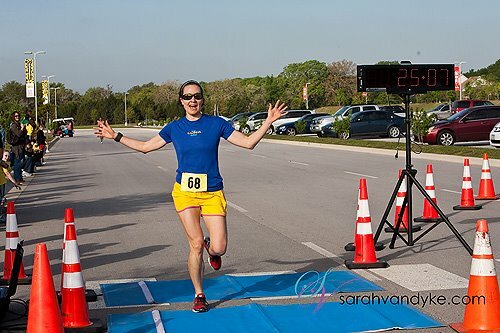 So I ran a 5K on Saturday. My first in over a year. That should count for something, right? It was very warm and humid. I wasn’t ready. I still have horrible breathing problems. After 1/2 mile I wanted to quit. Seriously. I didn’t. I ran the whole thing except the 2 water stops, where I paused to drink and catch my breath. It felt horrible. I knew I wouldn’t have a stellar time but I wasn’t prepared for the attitude I had toward my finish. I was disappointed. It was my slowest 5K since 2007. I am bigger. Not in as good of shape. And I still can’t figure out my breathing issues. These are all things I’ve not had to deal with in the last 7 years. ODB said he was proud of me. I’m actually glad he wasn’t there. It wasn’t one of my proudest moments. Looking back, I am proud of how I did, even though it wasn’t my best. It was the best I could do that day in my current state. It’s hard to accept when you’ve fallen from glory. Even harder to figure out how to get back there. 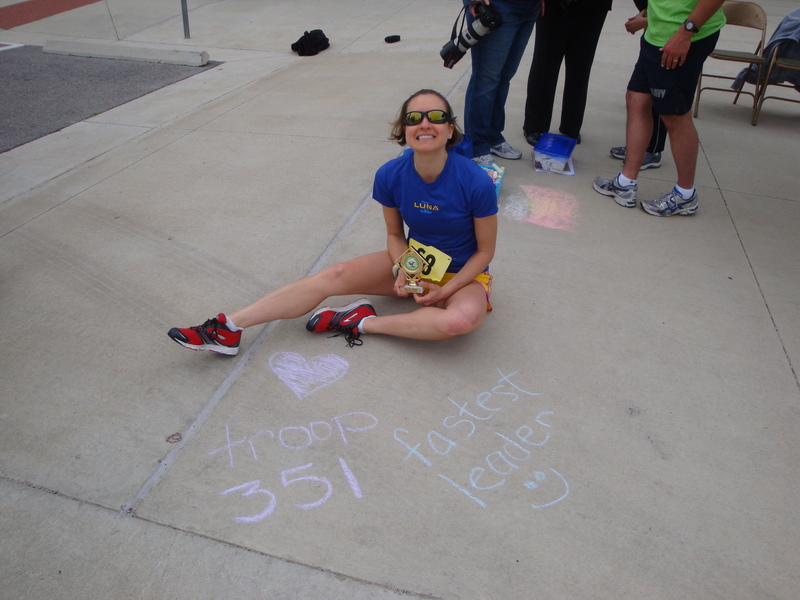 The race was put on by my Girl Scout’s Service Unit (group of troops in the area). It was a fundraiser for one of the other troop’s big trips. 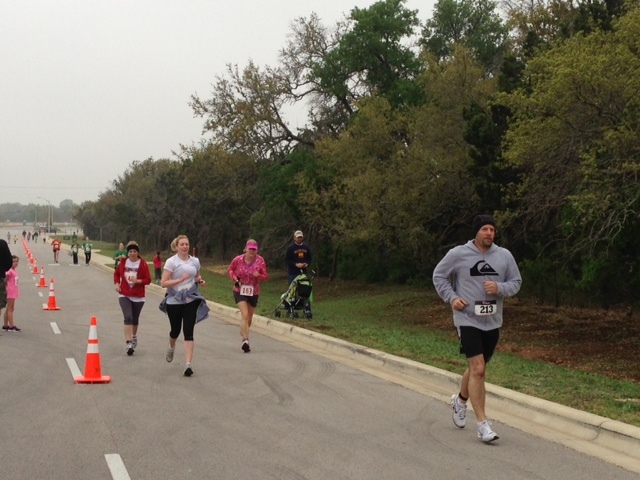 It was a smaller race, around 100 entrants for the 5K (which ended up being 3.5). The race packets were cool. One of the troops (of older girls) took t-shirts and made them into re-usable bags! I will post photos and directions soon. Great idea! If you are in the Austin area, they will custom make you reusable bags for FREE! 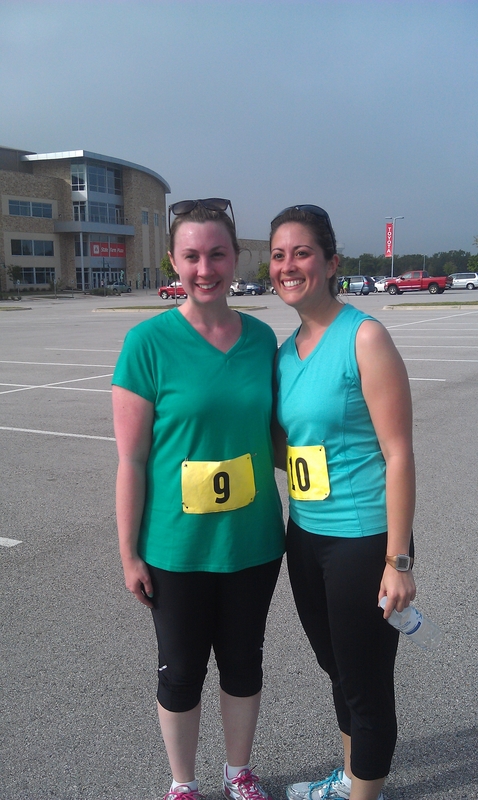 It was the first official 5K for my BFF and her friend. They both did great! I was exhausted from long hours from traveling and work training, but I did better than I expected. 2nd overall woman, 1st age group, 10th overall. It was my first 5K in almost a year (not including relays). No PR, but then again, the race was 3.5 miles, not 3.1. My watch doesn’t match the photo or the chip time, nice. I’ll go by my Garmin. It was a good morning for all. My mom and I both took home trophies. My hair looks CRAZY! Love this photo of myself with one of the Brownies from my troop. Showing off our awards. All of the kiddos who did the Daisy Dash got medals. I hope that next year all of my troop will participate in the fun! 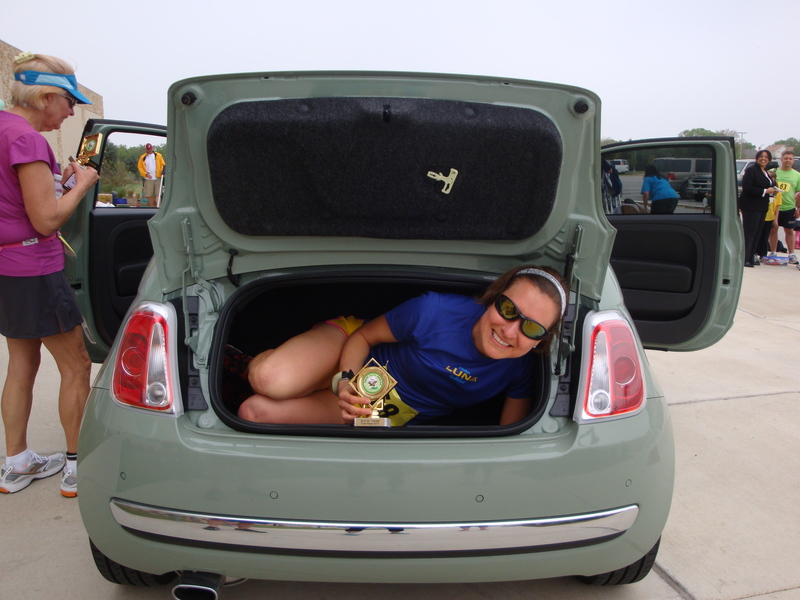 And because I don’t always act my age, I decided I needed to get in the trunk of the Fiat they were raffling off. I’m not even sure my suitcase would fit in there. For the record, I do fit…barely. Should have seen me trying to get out. I had to get out hands first, haha! Afterwards we went to Morelia Mexican Grill for lunch (tiny local chain). It was a GORGEOUS day. We chose to have some great patio time! 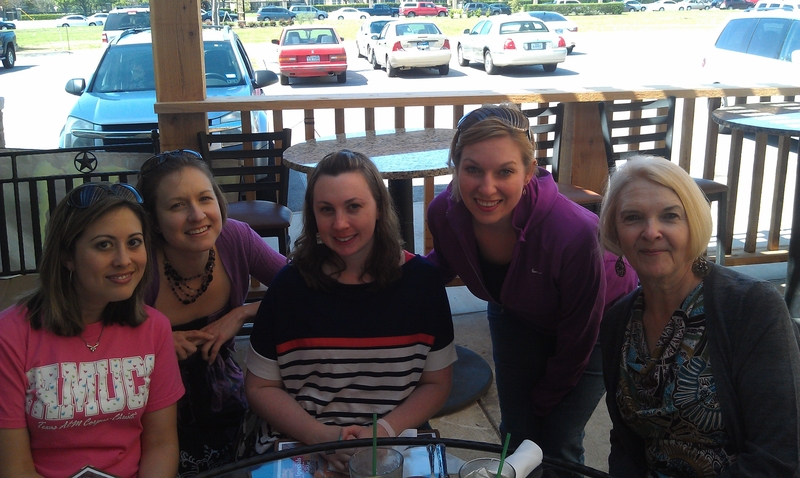 Lovely lunch with the gals and my mom. After lunch my mom, sister, and I shopped until we dropped at the Round Rock outlets. I was able to spend my Christmas giftcard at Ann Taylor and then some! Yay for new clothes, I never go shopping. 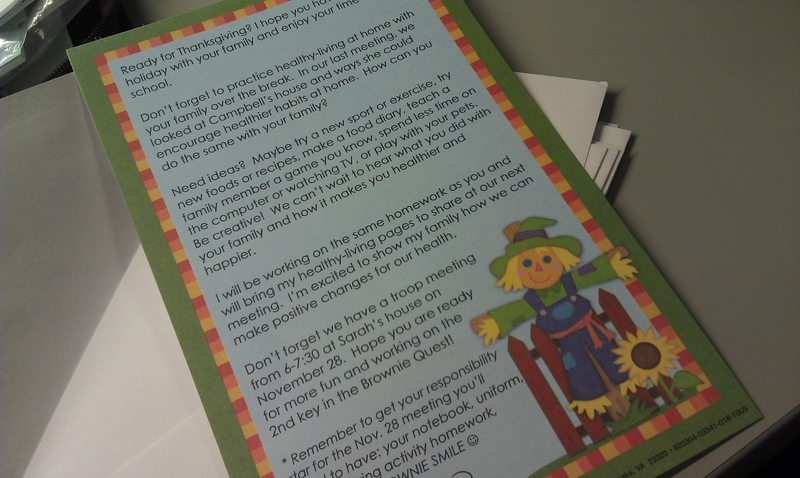 My Brownie Girl Scouts are working on healthy-living activities with their family this week for their homework. To help encourage them, I wrote them a letter with tips and ideas. 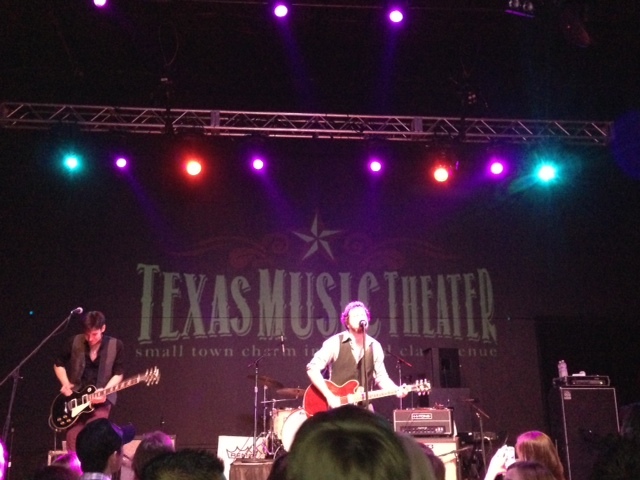 on Sunday December 11 at Travis County Expo Center . County Brown Santa, which benefits families in need at Christmas. Chuy’s Children Giving to Children Parade. Saturday November 26, State Capitol. Bring a toy to donate. I can’t wait until our meeting on the 28th to see what kind of healthy-living activities they did with their family. Whether it was trying new foods, trying new activity, less tv, more moving, teaching their family a new game, making better food and drink choices, etc. I’m doing the homework as well 🙂 I will start with Dan on Saturday and my mom and dad on Wednesday of next week. I don’t have to do their homework activities, but I think it’s a good example to show them I am working on the same goals as them! 70.3% Earn a household income of $75,000+ – Yes we do. 77.7% run 12 months a year – Yes, especially when it’s cold. Average number of miles run per week: 21.9 – Mine varies quite a bit, guess that’s average for me. All of the above, for sure. 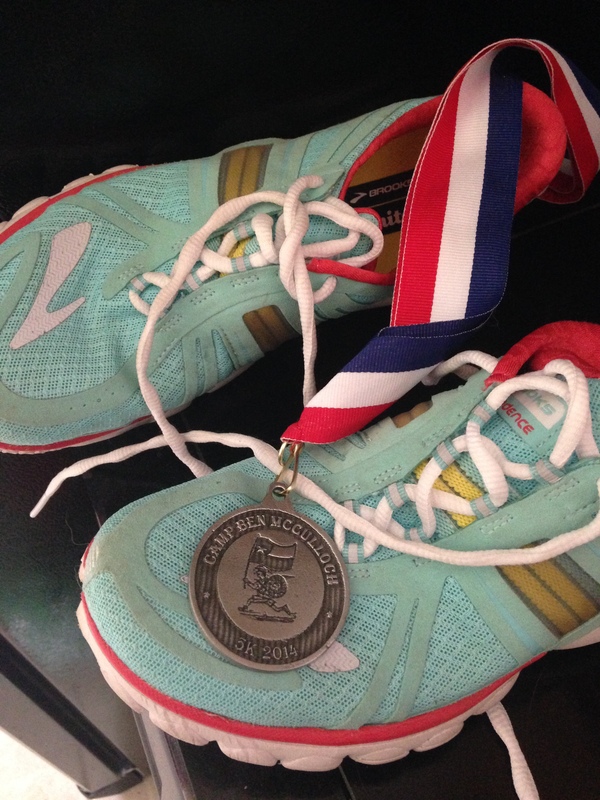 47.9% purchased their running shoes at a specialty running store – Not always. The last 2 pair were, at 2 different stores. Favorite brands of running apparel: I wear whatever I find that I like. Don’t care which brand it is. 59.6% purchased running apparel at a specialty running store — Not as frequently because they are often higher in price, but I do love a good sale. Average Height: 65.01 inches – that’s me! 40.9% are content with their weight – I’m content with my weight. I’d like some body parts to shape up better, but the scale doesn’t bug me. I’m in the healthy range, which is what I care about. 42.3% are content with their fitness level – I think there is room for improvement. My health was been an obstacle lately though. 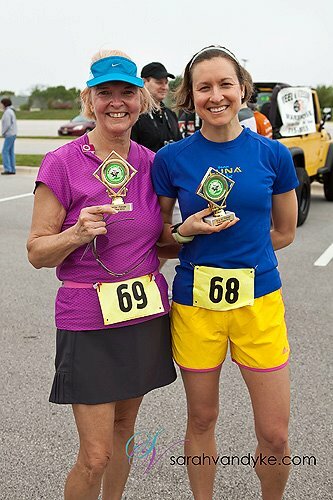 How do you compare to the average female runner? Heck of a week, heck of a week! Tuesday: weights at the gym in the AM, then Houston trip for work. LONG day. Ran errands on the way home. Wednesday: ran before work, caught up at work. Sick. Came home to recover. Thursday: weights before work, all day business meeting (no break for lunch, grrr! 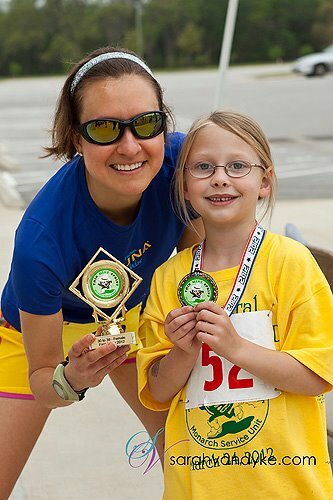 ), Moonlight Margarita 5K, which benefits Trail Foundation. Sister, AK, and I all went downtown together. 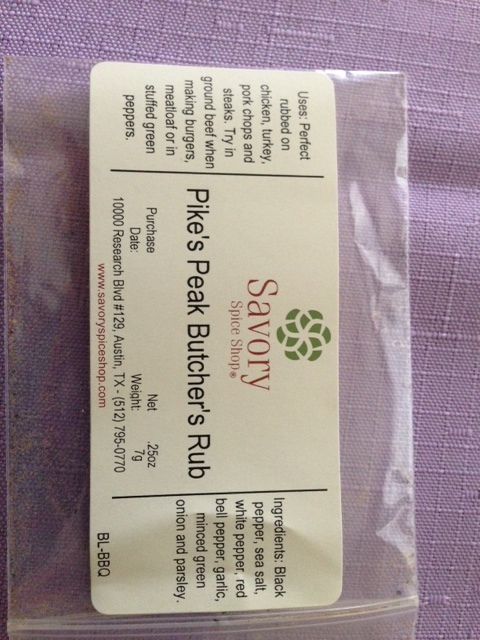 Got a black armband to wear to honor Scott Birk. I wasn’t feeling great again, so I ran with sister (I took a DNF because we were bib-timed and our finish was slower than my first 5K ever). She had a really hard time. I don’t think she eats enough and certainly didn’t drink enough liquids before. She was really dehydrated by the first mile. You have to eat people! 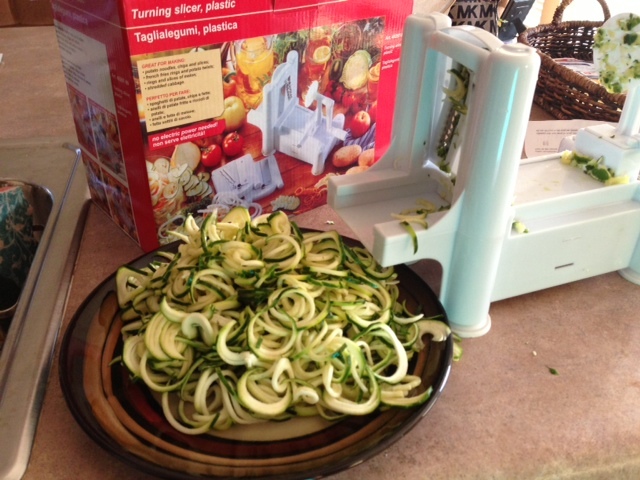 Even if you are trying to lose weight, YOU NEED TO FREAKING EAT! Starving yourself is just going to cause more problems. We met AK’s husband for a late dinner at Guerro’s. I’ll keep my observations about eating to myself. But if it comes down to health and safety, I am going to open my big mouth. Oh and I forgot to mention, my neighborhood was on fire Thursday. I came home a little early from work to check on it. All I will say is, when you actually need information from the news, they are useless. As was the city, who said no exvacuations, but the Austin newspaper said hundreds were being evacuated (which was true, just not my section). They promised the fire crews were staying overnight, so I felt a little better. My house wasn’t directly threatened, but it could have been bad. I think the final count was 60ish acres, no houses. Friday: long day at work, meetings, team lunch at Gloria’s (their tropical mexican salad with shrimp is GOOD!). Exhausted. Came home, Dan back from Canada. I was so out of it this week, I though he was in Chicago. That is next week. Dinner was burgers, sweet potato fries, and grilled veggies (I like football-ish food to watch Friday Night Lights)….on the Foreman. It was 105 in the sun. No way in hell was I going to grill outdoors on our patio which is 100% full sun in the PM. Saturday: Drove to Georgetown and ran a bit on road and trail. 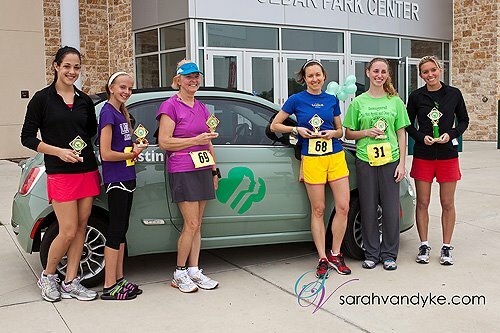 Then ran the “No Frill’s 5k”. Wore my black armband again to honor Scott Birk (who died Monday). The turnout was their biggest ever. Even though I was tired and wasn’t feeling great, I had a decent effort, no PR though (which I wasn’t even about to attempt in the heat). After the race, I drove to Sprouts and got some produce, then on to Weight Watchers, which is down the street. I didn’t get to a meeting this week and felt I needed to. I will say, that if I hear “free fruit is a miracle” one more time, I am going to scream. I always ate fruit and wasn’t afraid of it, not even when it cost me points on the old program. I enjoy fruit and don’t avoid it, never have. I didn’t get fat eating fruit.